By John Piper in A Godward Life: Book Two, Multnomah Press, 1999, pages 123-4. When Jesus was dead and buried, with a big stone rolled against the tomb, the Pharisees came to Pilate and asked for permission to seal the stone and guard the tomb. Pilate said, “You have a guard of soldiers; go, make it as secure as you can.” So they did. They gave it their best shot– in vain. It was hopeless then; it is hopeless today; and it will always be hopeless. Try as they may, people can’t keep Jesus down. They can’t keep him buried. They may use physical force or academic scorn or media blackout or political harassment or religious caricature. For a season they will think the tomb is finally sealed. But it never works. He breaks out. It’s not hard to figure out: He can break out because he wasn’t forced in. He lets himself be libeled and harassed and blackballed and scorned and shoved around and killed. Jesus said: “I lay down my life, that I may take it up again. No one takes it from me, but I lay it down of my own accord. I have power to lay it down, and I have power to take it up again” (John 10:17-18). No one can keep him down because no one ever knocked him down. He lay down when he was ready. If China was closed for forty years to Western missionaries, it’s not because Jesus slipped and fell into the tomb. He stepped in. And when it was sealed over, he saved fifty million Chinese from inside– without Western missionaries. And when it was time, he pushed the stone away so we could see what he had done. When it looks like he is buried for good, Jesus is doing something awesome in the dark. Jesus said: “This is what the kingdom of God is like. A man scatters seed on the ground. Night and day, whether he sleeps or gets up, the seed sprouts and grows, though he does not know how” (Mark 4:26-27). The world thinks Jesus is done for– out of the way. They think his Word is buried for good in the dust of irrelevant antiquity. But Jesus is at work in the dark places: “Unless a grain of wheat falls into the earth and dies, it remains alone; but if it dies, it bears much fruit” (John 12:24). He let himself be buried (“no one takes my life from me”), and he will come out in power when and where he please (“I have power to take it up again”). And his hands will be full of fruit made in the dark. “God raised him up, having loosed the pangs of death because it was not possible for him to be held by it” (Acts 2:24). 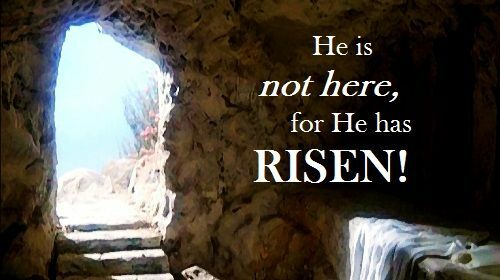 Jesus is alive today “by the power of an indestructible life” (Hebrews 7:16). For twenty centuries the world has given it their best shot– in vain. They can’t bury him. They can’t hold him in. They can’t silence him or limit him. Jesus is alive and utterly free to go and come wherever he pleases. “All authority in heaven and on earth has been given to me” (Matthew 28:18). All things were made through him and for him and he is absolutely supreme over all other powers (Colossians 1:16-17). Trust him and go with him no matter what. You cannot lose in the end. Stand in awe of his freedom and quiet, invincible power. Matthew 27:62-66 — The next day, the one after Preparation Day, the chief priests and the Pharisees went to Pilate. “Sir,” they said, “we remember that while he was still alive that deceiver said, ‘After three days I will rise again.’ So give the order for the tomb to be made secure until the third day. Otherwise, his disciples may come and steal the body and tell the people that he has been raised from the dead. This last deception will be worse than the first.” “Take a guard,” Pilate answered. “Go, make the tomb as secure as you know how.” So they went and made the tomb secure by putting a seal on the stone and posting the guard.